By using Aiseesoft DVD to iPod touch Converter for Mac, you can take a snapshot of your favorite picture and save it as JPEG, GIF or BMP format. 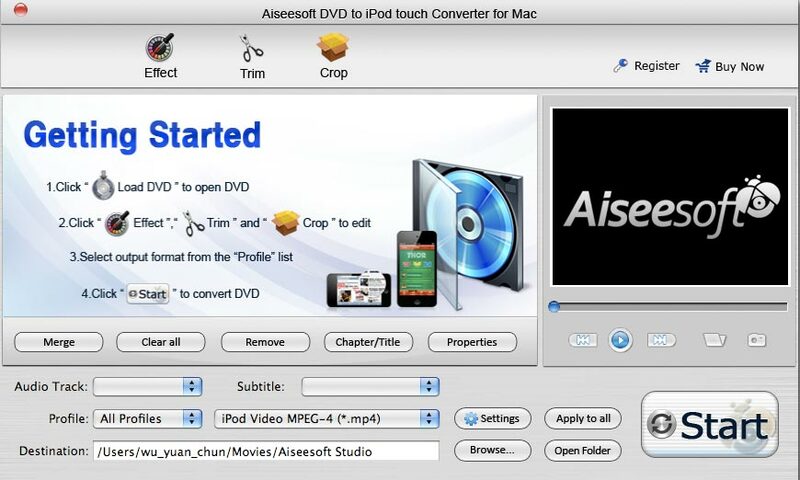 Aiseesoft DVD to iPod touch Converter for Mac can rip DVD to iPod touch video MPEG-4, H.264/MPEG-4 AVC, MOV, M4V and extract DVD to AAC, MP3, WAV, AIFF, M4A audios. With this Mac DVD to iPod touch Converter, you can convert DVD to different formats simultaneously. DVD to iPod touch Converter for Mac enables you to adjust video effects: Brightness, Contrast, Saturation and audio volume to optimize your output video effects. Detailed video and audio settings are provided by this Mac DVD to iPod touch software for you to adjust, such as Resolution, Video Bitrate, Frame Rate, Audio Channels, Sample Rate, etc. You are allowed to trim, crop, add watermark and merge two or more videos into one just for convenience and personalization. Because of the intuitive interface, this DVD to iPod touch Converter for Mac is quite easy for all users. No matter you are beginners or experienced users, only few clicks can finish the conversion.